Twitter beats both Pinterest a Facebook even although shoppers are 13 times likelier to share an item they bought with friends on Pinterest than on Twitter, and 8 times likelier than on Facebook. So says Zappos Labs, the research arm of the Zappos online apparel site. They have been experimenting with Pinterest—and the results are encouraging for Twitter but less so for Pinterest or Facebook. Will Young, director of Zappos Labs, told Bloomberg that although users are far more likely to share a purchase on Pinterest than on either Twitter or Facebook they found that items shared generate considerably less revenue than Twitter or Facebook. It’s particularly a problem for Pinterest as it’s marketing would like you to believe it to be better at monetizing social activity than Twitter or Facebook. So, is Pinterest a useful business tool? It might be disappointing for Pinterest but more to the point it is disappointing for all those pinners who jumped on the Pinterest social media bandwagon on perhaps the back of all the hype that surrounded its launch and initial limited access. Social media is not a fad and not likely to drop off the marketing landscape soon but like all media marketing it’s horses for courses and not all are equal. But, that doesn’t answer the question! This research highlights that the hype doesn’t always match reality. But, it also has to be recognised that all research is not always equal either! Amazon owns Zappos, and is a rival of Rakuten, a Japanese e-commerce giant and a Pinterest investor. Another study by Shopify, an online e-commerce platform, carried out in May, came to another conclusion! 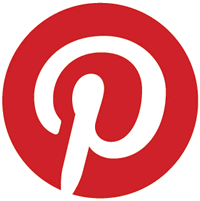 It found that visitors from Pinterest spent 10% more than visitors coming from other social sites. Again, this has to be seen in the light that their research focussed primarily on data relating to stores hosted on their own platform. There’s conflicting evidence and the jury’s still out! Clearly, different retailers have different experiences and varying success from different media platforms. It’s too easy to simply stick your head in the sand and believe the one that suits either your personal preference, the one you like or find easiest to use, or worse still, the one you have invested most time and effort with! The answer is in your Analytics! The best evidence is the evidence from your own website! Assuming you have something similar to Google Analytics installed you should have enough information available to get a good indication of where and which social media channels generate the most visitors and which contributes the most to your own bottom line. In Google Analytics, the first is to create an advanced segment for your social media channels so you can view site traffic and visitor behavior exclusively from sources like Pinterest, Twitter, Facebook, YouTube and any other you have invested time in setting up. From any standard reporting view, click the Advanced Segments button at top of page then on the + New Custom Segment button on the bottom right of opened panel. 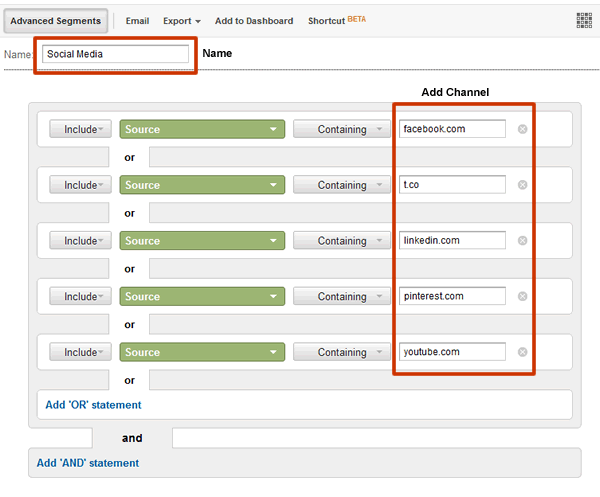 Add your channels following the illustration on right and save. It will appear and be chosen by ticking the box in the Custom Segments panel on the right of the page. 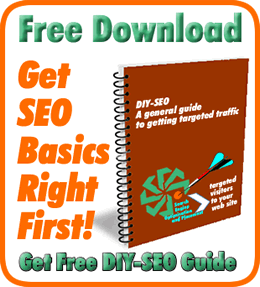 It will help you understand how visitors arriving from your social channels behave that is different or similar to visitors from other sources like search, direct, directories and other referring sites. 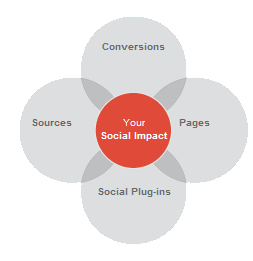 Assuming you have already setup goals within Google Analytics the Social Reporting under Traffic Sources gives both an overview of the impact your social media channels are having and which channels contribute most to site conversions. Introduced, and reported on back in August 2011, Multi-channel funnel reporting adds that extra and important layer to understanding how and where any channel, in this context social media, has on conversions. 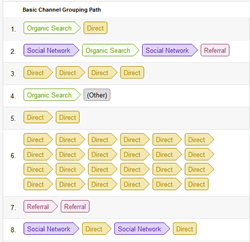 Found under the Conversions side heading on left enable you to understand the contribution each channel plays in achieving an eventual conversion be that a sale or other defined goal. What actions initiate engagement with your site and which are the closers and the paths to and from social media and time lag from first visit to final checkout and eventual conversion. Keeping, at least, one eye on the above can help you decide what social media channels to focus on, if any, or whether your time and effort might be better spent on more profitable areas.